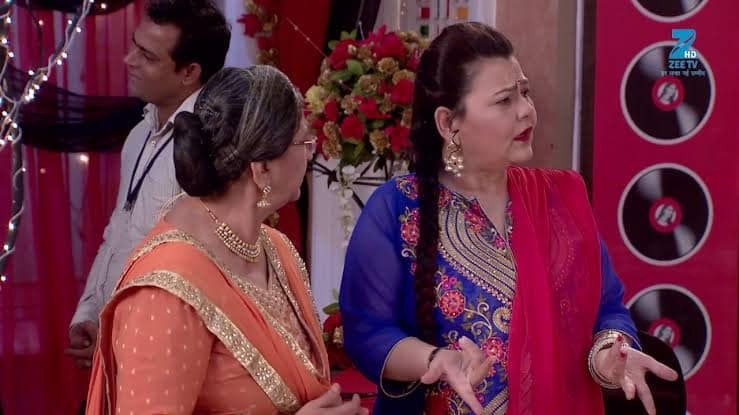 Daadi hears Tanu and is not able to tolerate Tanu’s absurd talk about the marriage. She interferes and informs the media that the marriage is postponed due to Purabh’s ill health. Daadi adds that Abhi will not marry till Purabh is well. She asks Tanu not to think about her marriage but to think about Purabh’s health. Pragya doesn’t want Daadi to take stress, so she takes Daadi away. Tanu immediately tells the reports that that Daadi has some confusion as the marriage will take place as decided and is not postponed. Pragya asks Daadi not to take tension. Daadi says that she wants to teach a lesson to Tanu. Aaliya is standing and watching everything, she only wishes that Purabh gets alright, so she doesn’t interfere with anything. Abhi also comes to the party looking for Pragya and directly goes to meet who is asking Daadi to not stress about Tanu so much. Just then, Robin comes and tells Pragya that she is needed somewhere. The media shifts focus to Abhi and Tanu rushes to be with him. She tells him how good he is looking and stops when he is busy looking for Pragya. He leaves Tanu when he sees Pragya fixing some decoration. And then she falls in his arms and they look at each other. The media disappears now. They get interrupted by the clients who praise Pragya's preparations and Abhi flirts with Pragya that she is looking beautiful in a black sari. He compliments Pragya and calls her ‘tota’. Pragya wonders what it means. Abhi says that in Punjabi language, when a girl looks very pretty then they use such word. Pragya smiles and they are again lost in each other’s eyes. Tanu gets irked and asks Aaliya for help to stop Abhi who just taunts her back that if Tanu wants, she can remove Pragya too, like the way she tried to remove Purabh. Tanu gets more irritated. They bicker about Purabh and Aaliya makes it clear that she is not going to do anything about Pragya now. Daasi tells Daadi about Abhi's surprise for Pragya once Abhi launch the album and Pragya comes asking about what they were talking. Pragya keeps asking them about the surprise and Tanu who hears them comes asking about who is going to surprise whom. But Daasi lies to her that Abhi has a surprise for her and she should wait for it. Tanu smiles thinking Abhi has a surprise planned for her. She gets very happy and thanks Daasi for this. The hosts of the party call Abhi on stage to talk about his latest album. Everyone gathers around the stage to hear Abhi. Abhi firsts takes Purabh’s name and gives credit to him for his new album. He talks about how special the album is to him since Purabh was his biggest support. He says that his new album is very different from his old albums as he wrote his feelings in words. Tanu asks a reporter to ask who his inspiration for the album was and she obliges. He is feeling so strongly for someone that it influenced his poetry, his writing. The media person asks Abhi who is the inspiration behind his new album. Abhi smiles and raises his finger towards Tanu. She gets happy as all the cameras turn towards her, but not for long as Abhi takes Pragya’s name who is standing behind Tanu. Obviously Tanu who is expecting her name but he takes Pragya's name is shocked. Pragya too is shocked. He also talks about how much he feels for Pragya. He tells everyone how special Pragya is to him. Both Aaliya and Tanu are shocked by this. Abhi tells everyone that his inspiration for his album is his best friend and secretary Pragya. He introduces Pragya as his best friend and asks her to come on the stage. She hesitates. He insists her to come by holding her hand. Daadi and Daasi ask her to go. She goes on the stage. Tanu and Aaliya feel jealous. He introduces everyone to Pragya and says she is not only his friend but also his inspiration who always supported him in all the ups and downs. Tanu is angry to see all this as Abhi claims Pragya is the inspiration of his album. Abhi tells them what importance does she hold in his life that people say that friends are those who are with us in bad time but he has left his bad time behind. He says for him a best friend is someone who is always with you in all circumstances and understands you very well. Abhi says that he wants his best friend Pragya to launch his album by unveiling its cover page and this is his gift for his best friend Pragya. Everyone gets shocked as he asks her to launch the album. Daadi feels Abhi might express his feeling to Pragya. Abhi asks Pragya to unveil the cover of the album and Tanu and Aaliya are shocked to see Pragya’s picture on the cover of the album. Daasi smiles at them and happy that Abhi's album launch is a success. Everyone gets more shock to see Pragya's picture and her name 'Fuggi' on the poster of his album. Aaliya scolds Mitali for not doing her job and asks why she did not remove it from there. She says that Tanu must be very upset and goes to look for Tanu. Pragya who finds her picture and the name ‘Fuggi’ over the album cover page gets overwhelmed by Abhi’s gesture and dosen’t know what to say and starts crying. Abhi says it's okay if she doesn't want to say anything because her tears have expressed everything. Pragya says she will never be able to thank him enough for giving her so much respect and that she can live her entire life with her head held high after the respect Abhi has given her. Everyone cheers and claps for them, except Tanu as she is very irritated and angry. The media requests them to dance together and they agree. Abhi and Pragya perform on a romantic number. Abhi's family get happy to see them dancing while Tanu and Aaliya fume in anger. Tanu drinks in anger when she finds out that he has dedicated the album to his muse, Pragya. Mitali and Aaliya see her drinking. Aaliya stops her from drinking and asks her to not do anything and once she is married to Abhi she will throw Pragya out of the house. She says Abhi will never respect her like he respects her after marriage. Aaliya asks her not to drag her between her and Abhi and further asks her not to over react and go in her room. She promise to call her once the drama is over. Tanu thinks that Aaliya is deliberately not taking any action against Pragya, as she wants her ( Tanu ) to feel bad. Mitali tries hard to hear their conversation but fails. Aaliya asks Robin to take Tanu to her room. Tanu goes upstairs, Mitali follows her to keep an eye on her. Meanwhile, Abhi and Pragya are so lost in each other’s arms that they forget they are surrounded by so many people. Everyone notices their closeness. They clap for Abhi and Pragya. Daadi sees them dancing and cries thinking about Purabh. Daadi missed Purabh and says he had arranged this party for Pragya and Abhi and today he is not here to see the party and the smile on Pragya’s face. Tanu starts throwing things as she feels jealous thinking about the attention Abhi gives to Pragya. She is shouting and yelling in her room, she throws all her marriage clothes and jewellery. Mitali comes and asks why she is throwing things and her expensive jewellery away. Tanu asks her to leave otherwise she will take out all the anger on Mitali. Tanu says that Pragya has hurt her deeply. Pragya has snatched all her happiness and self-respect in one go. She took the entire media attention from her. Mitali quickly steal her diamond jewellery. Daadi and Daasi appreciate Abhi and Pragya and say they were looking like the perfect pair. The media people are so impressed with Abhi and Pragya that they want to take their interview together as a couple. They call Abhi and Pragya for an interview. Pragya hesitates, but Daadi and Daasi push her. They ask Pragya since when she knows Abhi as their jodi looks very romantic and perfect. Pragya drops a hint of wanting to marry Abhi and that she doesn’t know how she looks with Abhi, she just wants to have a relationship with Abhi for next seven lives. Abhi says it feels they know each other since two lives and Pragya says she feels they will stay together for seven lives. Abhi gets excited and wonders if Pragya is giving him a hit that she loves him and wants to be his wife because only marriage is what ties couples with each other for seven lives. He wonders if this is a signal. Pragya hopes Abhi has got her hint and feels if he does not understand she will definitely tell him about her feelings clearly. The reporter asks Abhi and Pragya to pose together as a couple. Jounalist makes Pragya pose for the camera as they want to shoot Abhi’s best friend exclusively. Pragya agrees and starts posing. Abhi sees that her blouse's zip has opened and goes and stands with her to cover it. Journalists tell him that they want a solo picture of her. Abhi refuses to leave her side and make them click their couple pictures. Also, he hides Pragya’s back with veil and asks the cameraman to take only front pose. Daadi calls Pragya. Abhi goes along with her hiding Pragya’s back wherever she goes. Daadi asks why is he following her like this. Abhi still doesn’t leave her. She says she will talk to Pragya later and leaves. Abhi hugs Pragya from behind and takes her to his bedroom. Pragya gets irritated when Abhi pulls her in the room and asks him what is he trying to do. She asks if he is making fun of her and that he just wants to tease her. He shows her the mirror of her back and tells her to zip up her blouse as it was showing in the party and that is why he was covering her back. Pragya gets embarrassed to see that her blouse is open. She understands that Abhi was trying to hide this and apologizes to him. Abhi sees her struggling with the zip and offers to help. She agrees. He zips up her blouse. They share an eye lock. While the love birds are filled with joy and happiness, Tanu is filled with fury and she is sharing her sadness with Mitali, but Mitali is only interested in trying Tanu’s diamond jewellery. Tanu whose anger towards Pragya gets out of hand sees Mitali trying her diamond jewellery and asks her to keep it. Mitali is shocked as Tanu says she can keep all her jewellery and asks what does she want in return. Tanu is trying to bribe Mitali, as she knows that Mitali is a greedy woman and she can do anything to get the jewellery. She asks Mitali to help her in killing Pragya. Mitali gets shocked and gets scared, she says she doesn’t want to take any risk. She then asks what's her plan. Tanu tells her that she just has to bring Pragya to the kitchen and she will take care of the rest. Mitali gets scared and asks what is she going to do.Tanu who plans to burn Pragya from head to toe in the kitchen says she will set her ablaze. Mitali accepts to do it in exchange of her diamond jewellery.